The ball eludes three Heart players and two Jets. Photo: Roy Hay. Melbourne Heart set out to break a seven-game run since its last victory against Newcastle Jets last night at AAMI Park, but came up short in a two-nil loss against a team which played for more than 80 minutes with ten men. 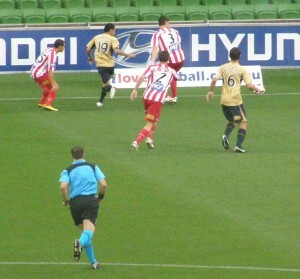 The first half was a disaster for the home team, though it was Newcastle which suffered the first blow in the 8th minute. 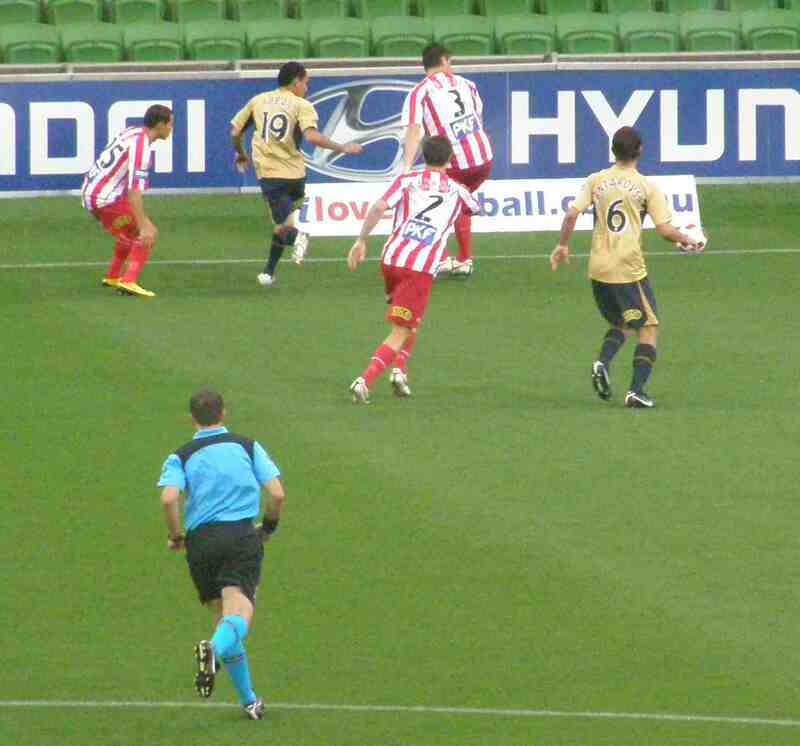 Jobe Wheelhouse became involved in an incident after the whistle had gone and knocked over Aziz Behich. After consulting his assistant, referee Alan Milliner, a late replacement for Peter Green who was overseas, sent off the Newcastle midfielder. Four minutes later the visitor went ahead when Kasey Wehrmann’s corner kicked was flapped away by keeper Clint Bolton but only as far as Francis Jeffers and his deflected shot found the net. Six minutes later it was two-nil when Jeffers turned provider finding Marko Jesic overlapping on the right. 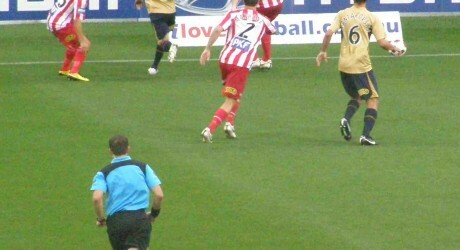 Jesic took the ball in his stride and curled it past Bolton who was stranded well off his line. The home team replaced Brendan Hamill with Jason Hoffmann to increase its attacking numbers after 27 minutes, with Michael Marrone, who started in midfield, reverting to his normal wing back position. When Heart did put a good move together Aziz Behich beat two men deep on the right and laid the ball across goal only for Nick Kalmar to completely miscue with the goal gaping. In injury time Behich had a shot to the keeper, and when it rebounded Matt Thompson’s deflected effort was also claimed by the excellent Matthew Nash. Kristian Sarkies replaced Michael Beauchamp at half-time as Heart went man on man at the back. The second period saw a procession of Heart attacks but no reward for the effort. Shots from distance and close range, near things with headers, two strikes on the woodwork and a couple of occasions when Heart players got in each other’s way at the vital moment meant that the half was full of incident and kept the bedraggled fans on their toes. Overall Heart had twenty-three shots on goal to two by the Jets, but both of the latter ones counted. Nash was clearly the man of the match, though Heart helped make him look good with a number of shots from distance which were meat and drink to the big keeper. The Jets did have a couple of rubs of the green when Ljubo Milicevic barged over Jason Hoffman in 67 minutes and Nikolai Topor-Stanley took a shot by Behich on his upper arm, but in neither case was a penalty kick given. John van’t Schip was clearly disappointed that his players could not convert their territorial dominance into goals. ‘It is not enough to be creating chances and dominating, we need to get it right up front,’ he said. Forecast storms deterred the fans but did not cause problems for the players and the surface remained in excellent condition throughout the match. Heart rested John Aloisi ahead of the derby against Melbourne Victory on Saturday and Kristian Sarkies started on the bench for his first game since breaking his leg before the season started. 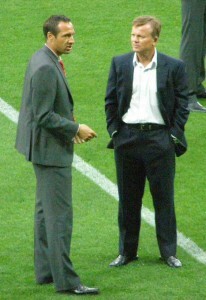 The coaches John van’t Schip and Branko Culina spent nearly half an hour in conversation on the pitch prior to the game. Van’t Schip coached Jason Culina, when the coach’s son and later Socceroo was at Ajax. ← Why did we not learn from our history?